Summit may be over for another year, but everyone is still recovering in one way or another. But despite this, we've had a busy week so here are the highlights! The Arquillian team and community have been extra busy over the past few days, what with releases of TestRunner Spock (got to love the name! ), Warp, the Guice extension, and the Spring extension! Well done to everyone involved. If you're interested in testing, then you really should check these out. Never one to be outdone, the Errai team have pushed out a lot of their own releases too over the last couple of weeks and Christian explains why in a separate posting. But these include JPA Data Sync, which is a great addition to the project! Of course with Summit last week we've seen a lot of postings on the event and how it went, including the obligatory Asylum podcast, one from myself (I'm not usually into self-publicity, but there are some good photos) and another from Eric. And speaking of Eric, he's given us a sneak peek at a new BAM component coming your way very soon! Shane talks about a new project (Windup) and how it can be used to assist in migrations from other application servers to JBoss implementations. The end goal is to try to automate as much of this as possible as well as assit in JBoss-to-JBoss migrations. Since it's all open source, if you have a need for this kind of tool then you should definitely check it out and get involved. Finally of course we've had our usual flurry of other project releases, including 1.3.1 Final of Forge, PicketBox XACML version 2.0.9, and the second candidate release of Infinispan 5.2.0. OK, until next time, happy reading! I'll leave you with a reminder of where Summit will be next year too! By now, the annual Red Hat Summit in Boston should aproach its end, after a week of great announcements, talks and live code demos that wrapped up very nicely a year of continuous innovation and hard work, in particular in the world of JBoss. Boston wasn't only the host of the Red Hat summit too, though, but also of other JBoss events, that preceded it: as usually, developers were given a chance to enjoy the highly technical sessions of the JUDCon and CamelOne. While having JUDCon Boston lead to the Summit has become a tradition in the last years, it was a premiere for CamelOne this year. Those of you who were fortunate to attend are invited to share their thoughts and impressions. Meanwhile, the rest of us who did not, can still experience some of the goodness, as recordings of the event start to emerge. So, as every year, the most important innovations ihave been highlighted by the JBoss keynote, which this year focused on cloud, big data and enterprise integration, and, as ususal, covered a wide area of interest, from the overall middleware strategy to the actual, hands-on, demonstrations of the state-of-the-art JBoss technology. In fact an impressive demo has quite a tradition at the start of the conference. You can watch the entire keynote here, as well as other other interesting videos from the Summit on its dedicated YouTube channel. In addition to that, the presentations from the summit have been posted as well, so you can get a glimpse of the excellent content from the conference. And of course, watch the weekly editorial for news, as attendees and presenters start sharing their impressions, as they return home. But the train of innovation runs fast even during the conference, so we have other interesting developments to talk about. $title says it all. Announced during the Summit, OpenShift has exited the "developer preview" phase and now the first production-level commercial offering is available, making JBoss EAP (along with a few other components) available as a supported, commercial-grade runtime in the cloud. Innovation doesn't only mean powerful runtimes and clever frameworks, but tools and expertise as well. To that end, Red Hat has launched the "JBoss Migration Center" initiative, based on the open-source Windup migration tool, which analyzes Java applications, reporting the changes required in various migration scenarios, like for example for migrating from other application servers such as IBM Websphere and Oracle Weblogic. Read more details in Frederic Hobain's post. With that being said, enjoy your weekend and join us next week with more news about JBoss! Next week sees the return of JUDCon to Boston, co-located with Red Hat Developer Exchange Day and, for the first time, CamelOne. The events kick off on Sunday evening with the JUDCon, CamelOne and Red Hat Developer Exchange reception, followed on Monday and Tuesday with full days of sessions and workshops. 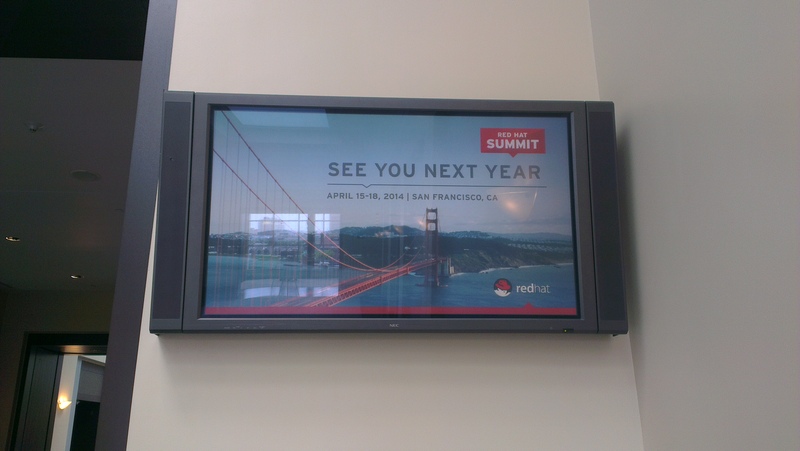 The excitement does not end there as the week then continues with Red Hat Summit, taking us through until Friday afternoon. Many of the core developers will be in Boston for the week, presenting on numerous subjects, and this will provide a fantastic opportunity for those attending any of the conferences to meet up and discuss topics that might be of interest to them. If you are dropping in on JUDCon then you may be interested in Paul's presentation on compensation based transactions. If you are more interested in Camel then you may be interested in Rob's talk on Connecting Applications with ActiveMQ or Claus' presentation, aimed at introducing Camel to beginners. The Drools team have also organised a walk in clinic on Thursday 13th, from 9:30am to 5:00pm, and anyone is welcome to visit. You do not require a conference pass and are welcome to stay as long as you like. On June 12th there will be a virtual launch event for Java EE 7, during which development leads will provide overviews of their new JSRs. This will include our own Pete Muir, providing an overview of CDI 1.1 (JSR 346), and Emmanuel Bernard, who will talk about Bean Validation 1.1 (JSR 349). Pete has also written a post covering the new features that have been added as part of the CDI 1.1 specification. The decision to rename JBoss Application Server to WildFly was taken in order to reduce the confusion that existed between the project (JBossAS), the community and the product (JBoss EAP). The decision was not taken lightly and is intended to strengthen the existing relationships. While we have made every attempt to be open during this process, including holding a poll for the new name, I'm sure that many of you will still have a number of questions about the decision and how the WildFly project now relates to the JBoss EAP product. If so, take a look at Dimitris' and Jaikiran's posts on the subject as they try and provide some context and answers to those questions. Eric Schabell has been working with the jBPM Designer project team to create a demo installation of the designer running on OpenShift. Eric has also provided an initial OpenShift project allowing you to experiment with this by simply importing the project as you create the OpenShift application. The Drools 6.0 release bring many changes, one with an obvious impact to users being the replacement of the Guvnor application with Drools Workbench. The workbench has been rearchitected, now using the UberFire framework as the basis of the application. The 5.3 release of Infinispan includes a new feature which enables the use of the MongoDB NoSQL database as a cache store. Guillaume has more information about how the cache store can be enabled, either through configuration or programmatically, and includes a reference to where you can find more information. The AeroGear team have released version 1.0.1 of AeroGear.js. If you are interested in running Scala on the application server then take a look at the 0.3.0 version of Escalante, now including support for the Play Framework 2.1. This release also coincides with the announcement of the new Escalante logo. The Arquillian team have released the 1.0.4.Final version of Arquillian Core. The Weld team have announced their 2.0.1.Final release. The Seam team have announced Seam 2.3.1.CR1, a bug fix release addressing their outstanding issues. The tooling team have announced beta releases of JBoss Tools 4.1 and Developer Studio 7.0. That's all for this week. If you are attending any of next week's conferences then I look forward to seeing you there.